Pont suspendu de Fribourg (Suisse). In 1834, the wire-cable bridge came of age with the completion of Chaley's great crossing of the Sarine Gorge at Fribourg in Switzerland. Its unprecedented single span of 870ft remained the longest in Europe until the end of the 19th century, though it was surpassed in America in 1849 by Ellet's Wheeling bridge. In the design of his bridge, Chaley was influenced by Vicat, then the foremost authority on wire cables, particularly in the cable manufacture and anchorage detailing. In its turn, the Fribourg bridge was to influence future structures, notably in establishing the parallel system as the prime arrangement for cables. 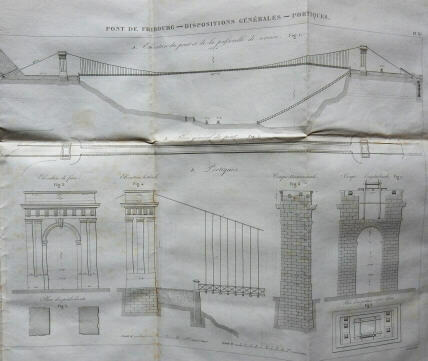 The present account, by the engineer himself, forms the major source of information on this bridge. Chaley covers the preparation of the wires which made up the separate strands, the difficult excavations for anchorage tunnels high up the walls of the gorge, the saddles resting on handsome doric porticoes and so on. In particular he describes the complex lifting process whereby the cables, prefabricated on the valley floor, were winched into place. Given the immense height of the gorge, this was a remarkable achievement. The bridge lasted until 1923, when it was replaced by the present concrete arch structure. 8vo. 55 + (1)pp, 3 folding engraved plates. Orig. blue wrapper. Apart from slight damage to back wrapper a lovely copy. Preserved in pamphlet case. Reprinted from the " Annales des Ponts et Chaussées ".